The new year is just around the corner and right for this we have just put together the hottest wedding trends of 2015 for you! Which kinds of wedding dresses are popular? What color should the decoration have? And which are the current hairstyle trends? We have all the answers for you! After all the brand-new collections and countless fashion shows of the most popular wedding dress designers one thing is for sure: the focus of the new wedding dresses for 2015 lies on femininity and romantic, confident styles! Lots of tulle, lovely Bohemian looks, amazing back views and beautiful off-the-shoulder necklines characterize the bridal fashion trends of the following year. Also V-necklines or statement cuts such as high waist, cut-outs or crop tops are going to be highly popular. In addition, you will find lots of capes, alluring details and dresses in the beach style. 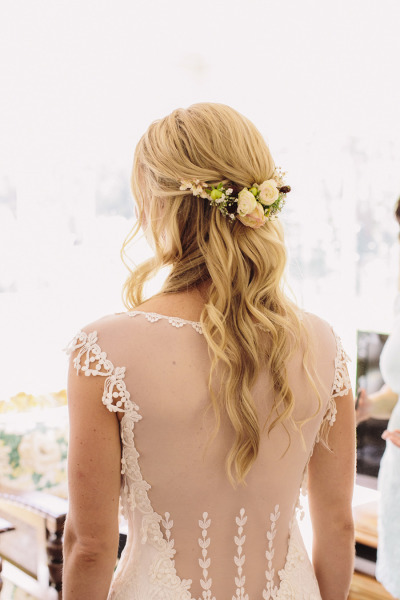 Apart from tulle, also lace will remain a commonly used fabric. Also concerning the colors, 2015 has plenty to offer: from soft shades of blue over light grey and mint green: pastel shades are doubtless one of the hottest trends of the next year! For those of you who rather prefer the classical style, also the traditional look becomes quite popular again: romantic, white dresses combined with modern, minimalist elements. Also the suits for the groom will be consistent with the new wedding dress colors: midnight blue is going to be the color for the wedding suit! If you like it more classical, you can also go for a grey or brown one. For those grooms who wish to change their clothes for evening, a dinner jacket with a bow tie is the perfect choice. Concerning hairstyles, it is going to be popular to wear your hair open, with some soft curls and braided elements. Those simple and feminine undone looks can be decorated with some extravagant elements. Also veils will remain a must have. In addition, floral wreaths will be the most popular accessory – not only for the bride herself, also for the bridesmaids and flower girls. In our next blog post you will find further, hot trends concerning the topics colors, invitation cards and decoration. We are looking forward to all the beautiful weddings in 2015 and wish you all a lovely Christmas time!